UK WILPF is a national Section of WILPF International, a non-profit, non-governmental (NGO) organisation with Sections on every continent. The International Secretariat is led by Secretary General Madeleine Rees and works out of Geneva and New York to coordinate WILPF work around the world. WILPF International has four standing committees: Constitution; Finance; Personnel; Organisational. Information about members of these committees and ways to contact them is available here. 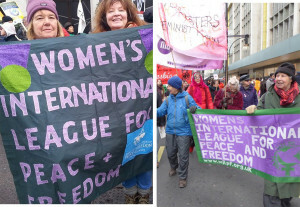 WILPF International now has eight working groups, all of which are open to members. Information about the mandate and agenda of each group is available here, as are contact details and ways to join. To stay up-to-date with WILPF International’s projects and programmes, you can sign up to a number of different e-newsletters.